With its green facade and octagonal minarets towering above Chinatown, Masjid Jamae is one of Singapore's many iconic buildings, attesting the country's multi-ethnicity and tolerance. 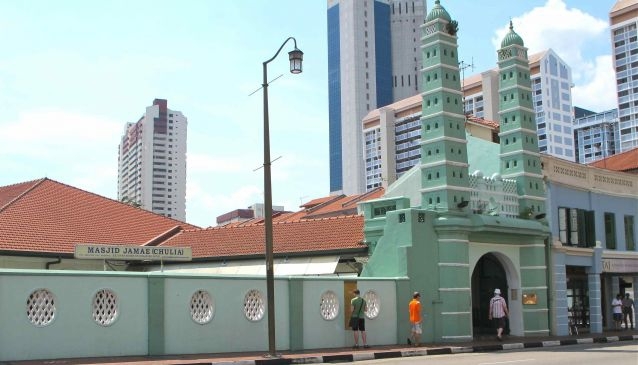 Established in 1826 by the Tamil Muslim community who came to Singapore from South India to work as Traders and Money Changers, Mashid Jamae is also known as Jamae Mosque, Chulia Mosque, Maideen Mosque but also King Mosque, the Green Mosque and the Big Mosque. Masjid Jamae has an heterogeneous style with a typical South Indian Facade and Neo Classical prayer rooms. Most of its facilities were built between 1830 and 1835. They include a gate, an ablution area, prayer halls, interior columns, a shrine and a garden. Masjid Jamae became a national monument in 1974. Visits daily from 10.30 to 6pm with a guide.